I’m so excited for our first Sew Our Stash. If you missed my fabric hoarding oh I mean announcement post make sure to check it out. But the short of it is that Bev from Flamingo Toes and I decided we really needed to get back into sewing for ourselves. So we are keeping each other accountable and sharing what we made for ourselves the last Thursday of every month. Check out Bev’s post too! 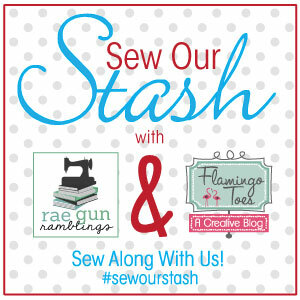 We are inviting you to join along as well whether you want to simply tag your pictures on instagram, facebook, or twitter with #sewourstash or even do a blog post like we”er doing (please comment with your link if you do so I can check it out ). I actually sewed quite a bit, compared to my normal ZERO, for myself this month. I already shared my crazy fast maxi skirt tutorial that I did for the Summer Trends series but I may have become a little addicted. I mean seriously is there anything more comfortable than a maxi skirt? Also I may have started a new habit of sewing myself something when I don’t feel like digging through the hamper of clean clothes to find something to wear. Yeah so this striped number came to life from that line of laziness and some of the fabric I picked up at Fabric Weekend. Next I have my new favorite Aline skirt. This one was actually my muslin/test skirt for my flared aline skirt that I already posted about. I actually like this basic aline better than the flared one. I’ve worn it sooooo much it fits great and is so easy to wear. Finally I sewed up this simple raglan sleeve, shirred dress. Last night not knowing what I felt like wearing today I decided that I still didn’t want to tackle the now two laundry baskets full of clean clothes to unearth something I felt like wearing. So I sewed this baby up. I had taken the pattern off a tunic I had umm ahem 3 years ago so yes it was drafted for a 30 lbs lighter me and yes it fits a bit higher up that it would have then but I still really love the fabric and it was super fast to put together. If you haven’t tried sewing with elastic thread it’s really not hard check out my easy shirring tutorial. 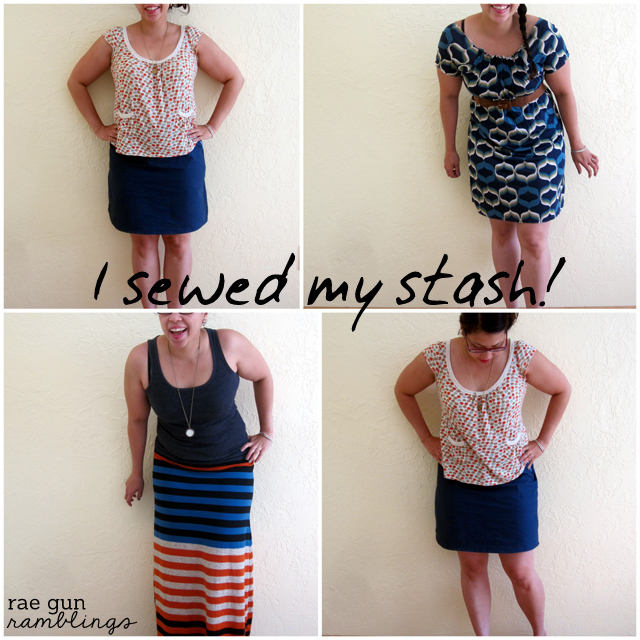 And there it is the first installment of Sew Our Stash in the books. Apparently I’m drawn to the deep teal haha. Also be sure to check out Bev’s post here. So what have you sewn from your stash this month? I love this challenge. I have so much fabric its unreal and have yet to make anything for myself in a very long time… off to go sew tomorrow on my day off! 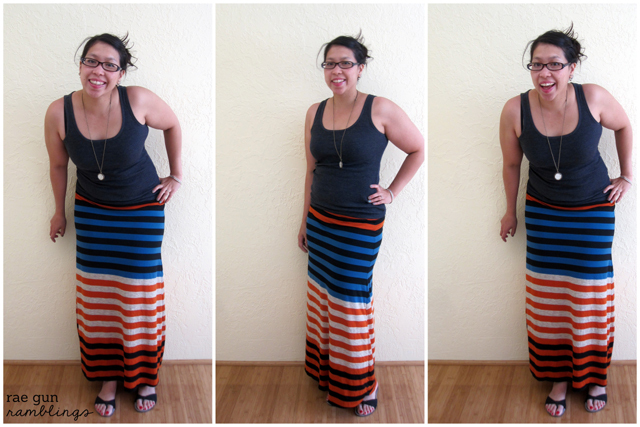 I love that maxi skirt! I need to make one! Love the maxi skirt! Looks so cute and comfy – perfect for summer. You looked great last night, too! What great summer outfits. I wish I knew how to sew. Eeek! Oh my gosh it’s all so cute!! 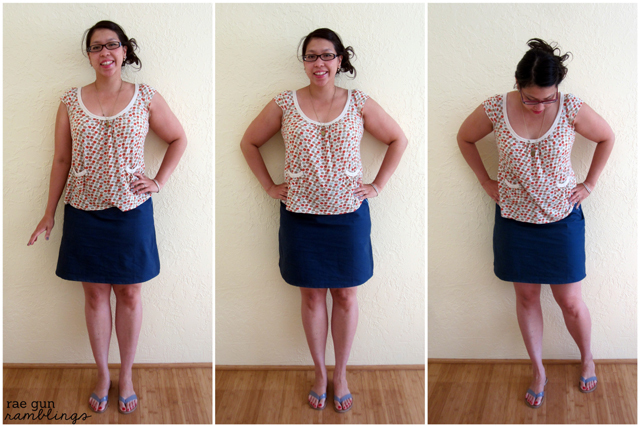 I love the skirts – I am wanting to do an A-line this month! And that dress!!! I can’t believe you just whipped that up so fast. It’s adorable! You’re my hero. This is so great – now I’m inspired to sew even more! I envy your capability of just ‘whipping’ up a dress to wear the next day! I am a pattern, step by step girl in my rookie years! Love the shirring. I think I’m going to try that someday soon. I’m doing a bit a fabric stash busting too, just with all the off cuts! Your very clever, love what you have made. Found you at For the Kids Friday. LOVE them all!!!! And everything looks FABULOUS on you Marissa!